LA PAZ, Jul 25 (IPS) - An immense tide of people demonstrating to keep the Bolivian seat of government in this city took to the streets last week to show support for the indigenous Aymara and mestizo leadership, in the greatest expression of popular power in the history of the country. 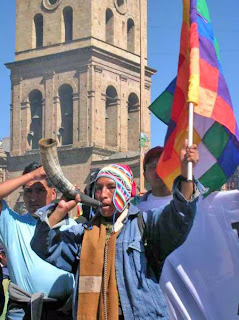 Laying apathy aside, the people of the western department of La Paz shattered all political and demographic predictions, coming together as one body, urban and rural, with deep Aymara cultural roots but embracing mestizos (of mixed indigenous and Spanish colonial ancestry) settled in the mountains and Altiplano (high plains). Immigrants from the country's other eight departments no doubt also participated in the gathering, which was free of regionalism and characterised by the solidarity that is typical of Aymara community traditions. The mass demonstration on Friday delivered an ultimatum to the Constituent Assembly to ditch a proposal to move the seat of government from La Paz to Sucre, the official capital and seat of the judicial branch, by Aug. 6. The greatest estimates were that between two and 2.5 million demonstrators participated in the rally. If confirmed, these estimates will cast doubt on some official figures. For instance, the state National Institute of Statistics (INE) said that in 2005, the population of La Paz department was nearly 2.6 million, of whom 1.6 million lived in La Paz and El Alto. Experts have also been saying that the population of La Paz is falling because of mass emigration to the department of Santa Cruz, which has 2.3 million people, according to official figures. But the sheer size of the rally appears to belie this claim. Peaceful, colourful, with the red, green and yellow Bolivian flag waving everywhere, and characterised by the gentleness of the people of the Altiplano, the social protest last Friday was definitely the largest to have occurred in the 182 years of Bolivia's independent life, local observers say. A few people fainted, but only one person was injured in an accident with a firecracker. Aerial photographs shown repeatedly on television show a concentration of people occupying the whole of the centre of El Alto, on the high plain next to La Paz, and several kilometres of the highway joining the two cities, interdepartmental eight-lane highways and smaller roads. The local daily La Razón published a satellite image of the crowd which, three hours after the main speeches, was still unable to disperse because of the press of people. If the number of participants reported by the rally's organisers is even roughly accurate, many things will change in this country of 9.6 million people, 67 percent of whom are still below the poverty line. The mass protest will oblige political strategists to revise their views and regard La Paz as the crucial base for future state policies, elections of new authorities, or attaining power by democratic means. The region's power had previously been expressed by the combativeness of residents of El Alto, who in October 2003 brought down government plans to export natural gas to the United States and Mexico at prices regarded as contrary to Bolivia's interests. They blockaded streets for 15 days, and at least 60 protesters were killed, in the last of a series of mass social protests in different parts of the country. Not only was the gas export programme prevented, but right-wing President Gonzalo Sánchez de Lozada (1993-1997, 2002-2003) was deposed only a year after taking office for the second time. This event marked a change in Bolivian politics: it brought the age of strongman leaders (caudillos) to an end, and empowered dozens of anonymous residents of the dusty streets of El Alto and campesinos (small farmers) in the surrounding rural areas, who spearheaded a movement in defence of natural resources and completely opposed to the free-market economic model and privatisations. These new agents of change, with the mayors of both cities and a group of La Paz citizens, have now returned to the struggle, seeking to keep hold of the economic activity generated by the presence of the executive and legislative branches which sit in La Paz. Meanwhile, the head of government of the department of La Paz, José Luis Paredes, engaged in a political juggling act between the region that elected him to office and the influential leaders of the eastern department of Santa Cruz, who want the presidency and congress to move to Sucre. Three thousand indigenous people from the province of Omasuyos, 96 kilometres west of La Paz, jealously guarded the head of the column of demonstrators and kept politicians away from it, in order, they said, to prevent any distortion of the true purpose of the rally. They were dressed in red ponchos and multicoloured knitted woollen caps with a black felt hat atop, and a ceremonial staff tied around the waist as a symbol of authority. The same red ponchos have identified insurgent Aymara groups who fought against Spanish colonialists and indigenous serfdom in republican times, and inspired guerrilla movements like the now defunct Tupac Katari Guerrilla Army (EGTK). The present vice president, Álvaro García Linera, was a leader and ideologue of the EGTK. Occupying the centre-stage and barring access to traditional politicians was an act of empowerment for the people of the Altiplano, but at the same time it reflected an absence of leadership in the form of someone capable of representing the aspirations of the entire department of La Paz. The National Electoral Court (CNE) recorded 3.7 million voters in the general elections of December 2005, 53.7 percent of whom elected Bolivia's first indigenous president, Aymara leader Evo Morales of the leftwing Movement Toward Socialism (MAS). Many observers say that the lead role is reserved for President Morales, who prudently abstained from supporting the aim of the "cabildo" (town meeting), and only commented on its importance. The department of La Paz extends from mountain peaks and highlands, across semi-tropical areas and into the Amazon region to the north, where immense natural wealth remains unexploited. Although it has proved its ability to mobilise people on a vast scale, the question of a leader capable of combining the ideas and interests of indigenous people, mestizos, and middle and high-income sectors remains unresolved. The rally was also an opportunity for Andean and Afro-descendant cultures to meet. Afro-Bolivian culture has been incorporated into the urban context in the past 10 years, with traditional dances to the agile rhythm of drums. Woven woollen cloths spread in the sun, with plenty of good food: potatoes, maize, fish, roast meat with cheese and red peppers, and a friendly invitation from campesina women, eased the difficult rapprochement between city dwellers and indigenous communities. The plaintive music of Aymara flutes and drums and the cheerful singing of young people's choirs from the city marked a true pact for the region. However, its future is uncertain because of the absence of social and economic projects that go beyond the immediate goal of keeping the seat of government in La Paz.